My latest obsession is almond butter. I was always apprehensive to try Almond Butter because it is so expensive and I couldn’t bring myself to shell out $8 or so to test it and see. I finally spotted a little single serve pouch of Justin’s Almond Butter and tasted it right out of the pouch. It was delicious and I got to thinking this has to be something easy to make at home…. 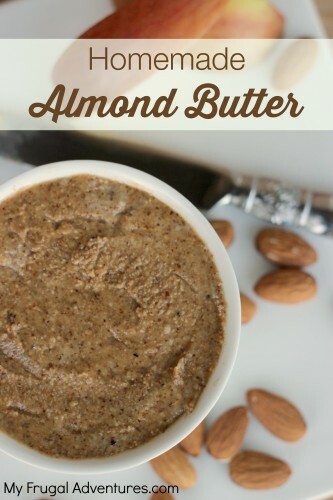 So I have a recipe for you to make your very own almond butter and it is so incredibly easy to do. 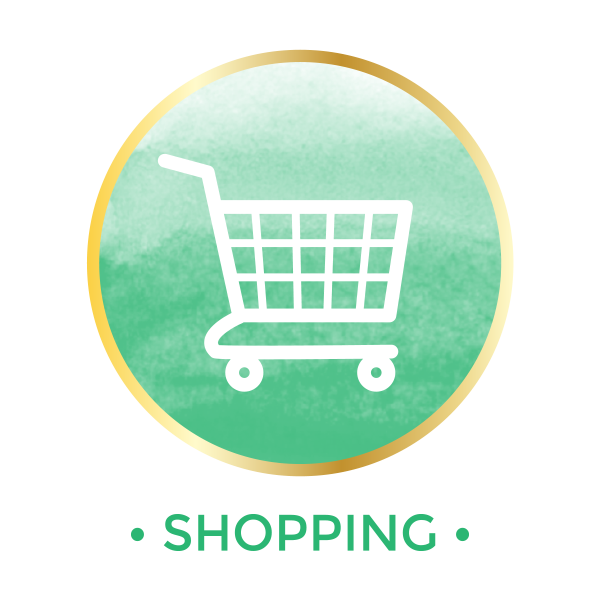 The nice thing is that you can control exactly what goes into it and you can customize exactly to your own tastes. 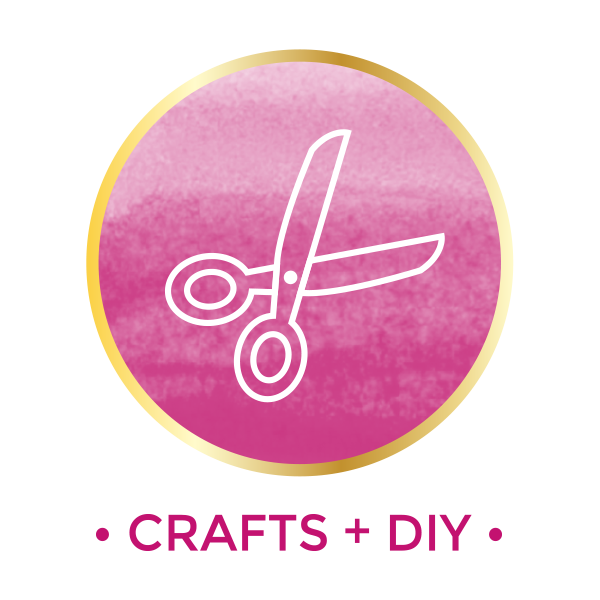 So I do have an official recipe for you below but really there are just a few steps to take and you can make as much or as little as you like. Now first off- what the heck is the big deal about almond butter? Well it is pretty good for you. It is loaded with fiber and protein and it has more monounsaturated fat and much less saturated fat then peanut butter. So it is a great way to start off the day (especially if you don’t usually eat breakfast) and I actually eat a spoonful or two before I head to the gym. I have also found on those occasions when I forget to eat and suddenly find myself STARVING I can grab a quick spoonful of almond butter and it fills me up enough to actually make a good choice (and not gobble down a handful of cookies or something). PS: Just saw an article this morning- The healthy foods experts really eat and almond butter was #2. The first choice is if you want to roast your almonds or not. I like them roasted because it gives an extra dimension of flavor that I really like. 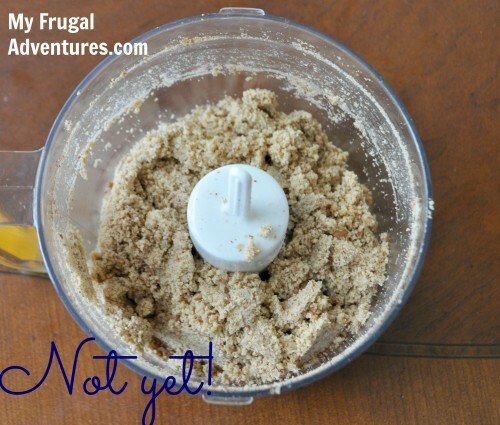 Once that is done you want to add the almonds to your food processor. Depending on how big of a batch you make you are going to be blending for awhile- I used about a cup of almonds for a quick little batch and that took maybe 5 minutes in total. I find that roasting them in advance makes the grinding process go by much faster. If you choose not to roast them, it might take a few extra minutes. One tip is that I have a fancy Ninja blender kitchen system thing and I have found my cheap little food processor did a better job with this particular task. If you have a Vitamix it should be really fast and easy to make this recipe. So now you start mixing- you should find that the almonds grind down to look sort of like bread crumbs very quickly… keep grinding. It will eventually start to look sort of gloppy like this… keep grinding! Just make sure to stop every few minutes and use a spatula to smoosh down what comes up on the sides. After a long while of grinding the almonds you will finally get the right texture to look like peanut butter. 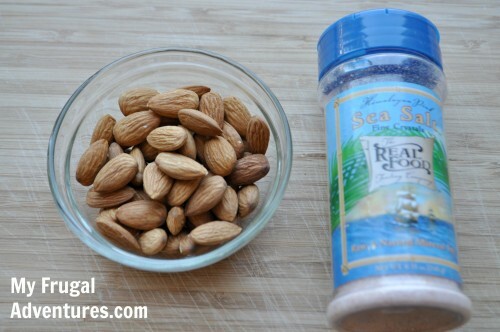 Now is a great time to add a pinch of sea salt (if you like) to your almond butter and give it a quick mix to incorporate. That is it!! Really simple. And I haven’t tried it but I think agave would be yummy as well. You simply want to add that into the food processor as you start to see your almond butter looking like the picture above. That means you are getting close to the finish line. If you do add one of the products above just note the shelf life won’t be as long so you might make a smaller batch or you can also add the extra ingredient in a small bowl just before serving. You will know it is done because it will look like a yummy creamy peanut butter. I like mine a little on the chunky side so the texture of homemade almond butter just can’t be beat. Go ahead and pop into a mason jar, tupperware etc… and you can store it in the fridge for up to 2 months. If you add an extra oil or syrup it will last probably about a week or two. Serve with celery, apples or on toast! Line a baking sheet with parchment paper and spread 2 cups of almonds out. After the almonds cool slightly place in a food processor to grind for several minutes (about 12-15). You want to stop every few minutes to push down what accumulates on the sides of the bowl. Continue to process until you get a nice thick, creamy texture. Sprinkle in a pinch of sea salt and blend once again just to incorporate. If you want additional flavor- add a teaspoon of coconut oil, maple syrup, agave or honey and mix well. 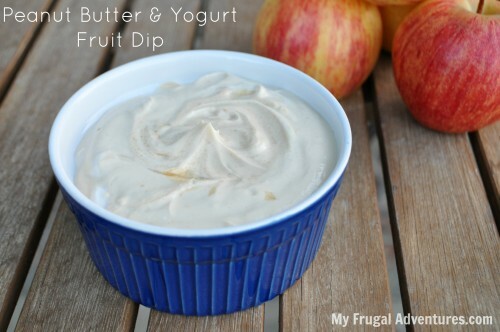 Try this easy fruit dip recipe using the almond butter! I love this stuff and I actually eat it straight as a high protein treat. 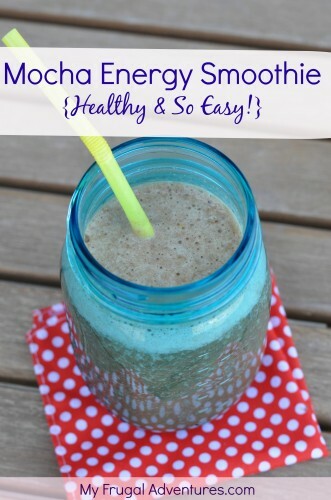 Mocha Energy Smoothie — no added sugar so this is a great way to control your sweet tooth with a healthy choice! Stephanie you can probably use a blender or whatever it is you use in the kitchen. I have a Cuisinart food processor that was probably $30 and I use it all the time. Charlene, where do you find the best deal on almonds? 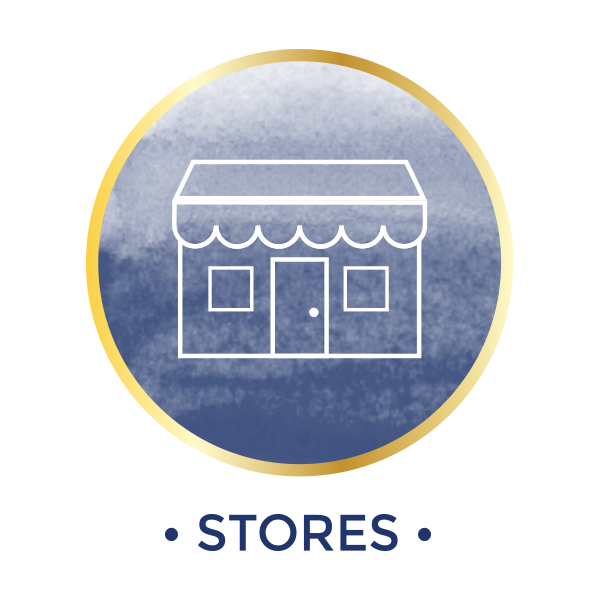 I too live in the North Bay area and have about looking into buying bulk from a farm; have you looked into this? No Kaila I have not. I bought these at Sprouts and it was $4.99/lb- so not cheap. I didn’t get organic I just got plain old unsalted almonds. Costco has 3lbs of almonds for $12.69 so that is the price to beat ($4.23). Sorry. My 18 mo. old pressed send early. Sprouts encourages you to try their products and if you don’t like it just bring your receipt and they refund your money. In case u want to try something that is not available in a small package. Jessica, I haven’t noticed that note but I will look for it. I think that is a great offer I’d just try not to take advantage. Anything returned will go in the trash so I’d feel terrible being wasteful like that. But I do love Sprouts and it is great how confident they are with their products! I was just at Sprouts this morning & ended up getting my groceries for free as a lucky Earth Day shopper. Totally unexpected and crazy, but much appreciated. Angela, my friend had an Earthbound Farms rep in the store last week and they randomly paid for her entire grocery cart too! Thanks. This worked great. I’ve made almond butter without toasting and this was soooo much faster and creamier. I tried this recipe and it was creamy before I added honey. Now it is dry and looks like almond dough! Any suggestions to make it a creamy texture again? 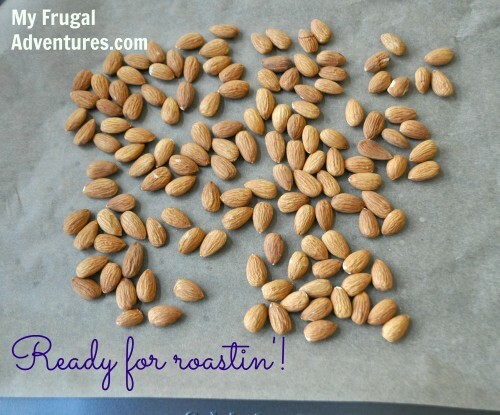 …I tried this recipe and after nearly 2 hours of blending I decided to give up, the almonds wouldn’t get creamy … I skinned the almonds and then roasted them for about 12min before blending …. ??? Manuela, you blended for 2 hours? How can that be possible? I would not do that again as you might ruin your blender. Do you have a food processor to use? I thought you removed the skin of an almond to make almond flour? The recipe doesn’t call for removing skins and this should take about 15 minutes. I can’t even imagine standing there for 2 hours. I would assume it was either your blender that wasn’t catching the almonds or more likely skinning the almonds in the first place was the issue. If you go to Costco or a specialty market they often have a station to make your own nut butters. You can go there to see this process does actually work just fine ;). Hi. Just a quick question on the raw nuts. Should they be soaked first? I know I soak to make almond milk (which I then turn the “pulp” into almond flour). However I am not sure whether for the butter to soak. What about using a Magic Bullet to make the almond butter? How many ounces of almond butter does 2 cups of almonds make? I don’t see why you couldn’t use a Magic Bullet. I have never used one but I would think it would work. 2 cups will make roughly 4oz of almond butter. So glad it worked for you Tam! Hi! I tried this recipe using maple syrup and roasted almonds. I must be lucky because I have a really old food processor that took about 5 minutes to grind 1 cup of almonds. The results are amazing! It’s the best almond butter I’ve ever tasted and doesn’t have the gross unsightly layer of oil that you get with the bought versions that seperate! Instead of spending $11 on a jar of almond butter it cost me about $3 in almonds. Thanks! So glad Wendy! I absolutely hate that oil layer too. It is just impossible to stir with making a big mess. Followed your ecipethis morning..no measuring..just threw whatever almonds I had on hand into food processor and blended. Definitely heed the be pent warnin as it took 15 mins plus of blending and stopping and scraping the sides. But it was so worth it. I posted a pic on my Instagram account Randyspears1730 if anyone wants to see it. Randy that looks fantastic! It is really good too right? I have another recipe I am tweaking for 3 ingredient energy bars you will probably like. I’ll post it in the next few days. I am frustrated to the max. I have tried making almond butter three different times. Each time has been a failure. I wanted almond butter without using oil, just the almonds to make their own oil. I first used dehydrated nuts. Used my Cuisinart, then threw them in my Vitamix, then back to Cuisinart. No dice. Finally added coconut oil. Second try was a failure even when I added oil. That time I soaked my nuts and put them in the oven to roast for a short time. This third time, today, I soaked my nuts and roasted them, threw them first into the Vitamix with the dry container. After 15 minutes, nothing. Transferred everything to my Cuisinart and turned it on and let it run for 35 minutes which at that time it shut itself off. Still nothing. I currently have it filled with the blob waiting for the machine to cool off so I can do something. I guess I’m going to have to add coconut oil again. Can anyone offer a solution to my problems? Sharon, I am not familiar with dehydrated nuts. Also is there a reason to soak the nuts? I use regular almonds. I don’t do anything to them. Just plain old regular almonds from the bulk bin or a bag. Have you tried that? I can’t say what the results will be with nuts that have been manipulated by soaking or dehydrating- perhaps that is the problem? Perhaps that is my problem. I’ll have to try that next. Right now I have to deal with my latest failure. Thank you for your reply. Thank you! I thought I was doing something wrong because it was taking so long. Glad to know its not just me. Charlene, I just have to let you know that I finally had success with making almond butter. This time I just took my almonds out of the bag (Costco, of course) and placed them on parchment paper on a cookie sheet in the oven to roast. As soon as I took them out of the oven, I just dumped them into my food processor, pulsed them to break the nuts down, turned the machine on, set a timer for 10 minutes, and left to do other things. At the end of the 10 minutes, I had BEAUTIFUL almond butter. So lesson learned, do NOT soak the nuts first. So you were correct in questioning soaking and dehydrating. 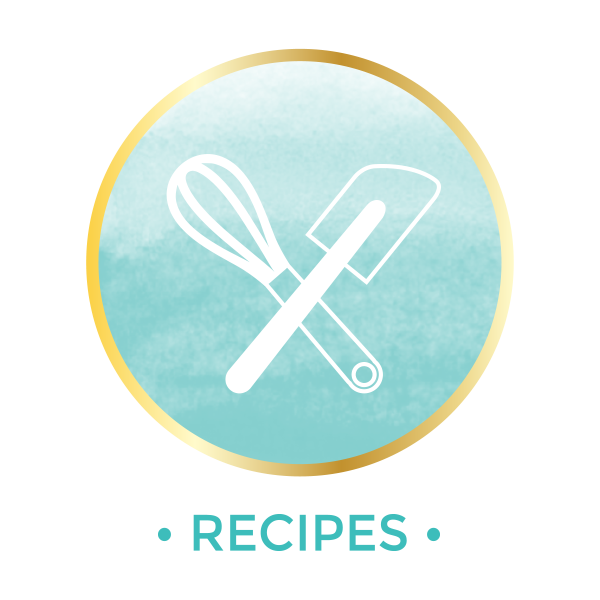 I have a question about your awesome little print button on the recipe. How did you do that? I’ve been trying, but all I can find is the HTML code for printing the entire page. Thanks so much for help in advance!! I am clueless about all that stuff. 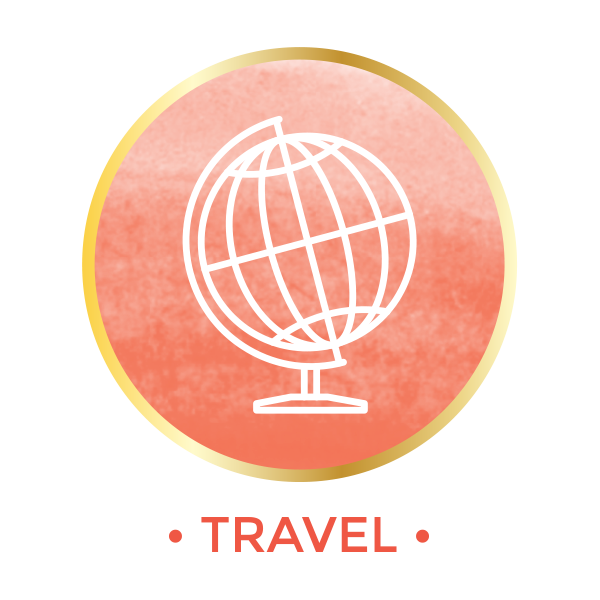 The site that designs my blog, Moritz Fine Designs, made the button for me. It only shows when people click the recipe title and not on my home page. Unlike all the other nut-butters I make, didn’t see any mention of including 1-2 TBS of olive oil. I followed the above, and way too much later, I have a HEAVY paste. . . not a “butter.” more like VERY thick Play-Dough! Audrey, almond butter is thicker and I have never heard of putting olive oil in nut butters. That doesn’t sound very appealing to me. I have read the ingredients on many different brands and I have never seen olive oil listed. Can you “can” this? If so how? Water bath? Christy, I don’t know how that would work- sorry. I really enjoy the information that I learn here. Do you have a good recipe for butter replacement? 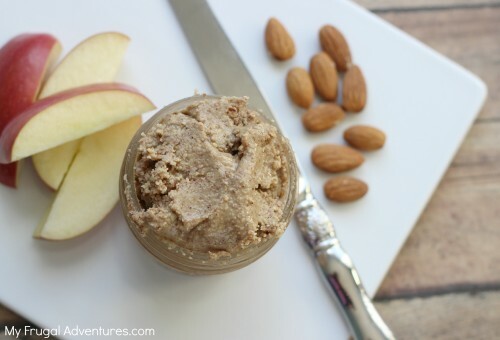 Katy- Almond butter is just like peanut butter but made with almonds. You might try Coconut Oil as a substitute for butter. That works well with fish or veggies. Now that was a very fast response! Do you add salt to it for vegetables? I like to add some Agave Nectar to give a little sweetness to my butter. I also at the very end add a TBS or 2 of a vegetable oil to make it more spreadable for my little ones. Can’t wait to try. I make cashew butter the same way. Good to have alternatives to peanut butter. I also make small amouts of peanut butter. I like to control the salt, sweetnes and oil. Thanks. I had the same issue with the honey! It was beautiful and smooth until I added 2 tsp of honey and it turned into a ball. Adding some canola oil helped smooth it out again but I will definitely avoid honey in the future. Thanks for the great instructions. I purchased organic almonds and did a search to find if I needed to roast the almonds before I made my first batch of almond butter. That search brought me here. You have great instructions. Let me say that while it’s okay to use a food processor that method usually requires adding oil. I splurged and purchased a Wondermill Jr Deluxe grinder to make my nut butters. (The stainless steel burrs are needed to grind nut butters.) The grinding method brings out the natural oil in the nuts so no added oil is needed. For people who are truly trying to reduce the fat in their diet a grain mill is the way to go. The expense is more but this grain mill will last a lifetime. I’ve already made homemade peanut butter and it turned out wonderful. Now that my almonds arrived it’s time to make almond butter. Thankshis week so now again. i want to ask can i use other nuts like walnuts or just normal peanuts for this kind of butter making? It is almond butter so I use almonds. You can do the same thing to make peanut butter if you want to use peanuts. Will def try this recipe. My favorite is Justin’s maple almond butter but their prices have started to get insane and not many places that carries it. I get Blue Diamond almonds and just buy it in bags at walmart. You can get a 2 lbs bag for like $12 which is way less than 2 of the 1lb bags. For other nuts I order from Tierra Farms and you can buy bulk there so it can get cheaper that way.